Driving Cape Breton Island's Cabot Trail is a wonderful experience, as long as you can handle curvy coastal roads and steep grades. You'll be amply rewarded with spectacular views, cultural experiences and outdoor activities. 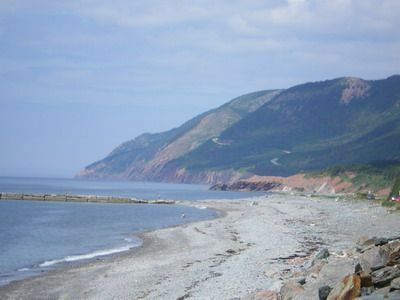 Take a photo tour of the Cabot Trail, Cape Breton Island's most famous drive. Guidebooks all say the same thing - driving the Cabot Trail in bad weather is no fun. Not only do you have to contend with slippery roads, you miss the views. The western side of Cape Breton Island features jagged rock formations, tidepools and natural harbors. Pull over at a "look-off" point for a better view. The Cabot Trail twists and climbs along the island's edges. As you look back, stand tall - you successfully navigated that ribbon of roadway. Chéticamp is the largest town on the Acadian (western) side of Cape Breton Island. Here, an island shelters the harbor and provides a safe haven for boats. Chéticamp is a great place to stop, stretch and explore. You can buy handmade Acadian craft items, enjoy a traditional Acadian meal and learn about traditional Acadian hooked rugs (tapis hook&3233;e). This church is actually the fourth to be built in Chéticamp. The Acadians brought the building stones by sled from the island in their harbor. The church's spire dominates the skyline of the town. You can go inside to see the altar, 1904 organ and the tomb of Father Fiset, who was pastor when this church was built in 1893. This traditional altar reflects the faith and strength of the Acadians. Side altars are a traditional design element in Catholic churches. This altar is dedicated to Saint Joseph, the foster father of Jesus. Chéticamp is the capital of the Acadian art of tapis hookée, or hooked rugs. The museum at Les Trois Pignons showcases this traditional art form. This rug was made for Chéticamp's bicentennial celebration in 1985. Elizabeth LeFort's hooked rugs hang in museums, the Vatican, Buckingham Palace and here in Chéticamp. Les Trois Pignons showcases her amazing talents. This rug depicts the icon of the Virgin Mary and child Jesus titled "Our Mother of Perpetual Help." LeFort also created her own elaborate designs - everything from all the U.S. presidents (on one rug) to the original Mercury astronauts - and spent countless hours pulling two-ply wool through burlap backing to make each exquisite rug. Part of your drive takes you through Cape Breton Highlands National Park, which offers hiking trails, picnic spots and campgrounds for outdoor enthusiasts. The MacIntosh Brook trail takes you to this small waterfall. It's a nice short hike. Don't forget your bug spray - you'll need it. Did John Cabot Land Here? No one really knows where Giovanni Caboto, the Italian-born explorer we know as John Cabot, first came ashore in Canada. Many historians think it was near here. This monument and park are dedicated to John Cabot, who went on to explore Newfoundland, return to England and vanish on his next expedition. We had to see these treacherous cliffs at Cabot's Landing for ourselves. While the so-called cliff isn't very dangerous, the winter storms on Cape Breton Island can bring strong winds. Storms and winds bring waves, which may be why the beach at Cabot's Landing is popular with surfers. To reach Bay St. Lawrence and Meat Cove, you'll have to leave the Cabot Trail and veer north at Cape North. The road to Bay St. Lawrence passes Cabot's Landing. This road is in good condition, and you'll be rewarded with views of this pretty harbor and the northern coastline. The road to Meat Cove, on the other hand, is eight kilometers of gravel, dirt and mud. In this photo, you can see fog creeping over the mountains from the Atlantic side of the island. The Gaelic College of Celtic Arts and Crafts is the only place in North American where you can study both the (Scottish) Gaelic language and Celtic culture. You can take classes here at the college or online. Offerings include Gaelic language and song, bodhran, fiddle, dance, weaving and more. This museum, located on the Gaelic College campus, explains the migration of Scottish settlers to Cape Breton Island and points beyond. The museum features multi-media exhibits on various aspects of Scottish culture, including music and dancing. The Great Hall of the Clans includes displays of various types of plaids and kilts. If you're of Highland descent, you can find your ancestral tartan in the museum's Clan Histories exhibit. This display shows a gentleman wearing the MacKenzie tartan. Baddeck, known as the home of inventor Alexander Graham Bell, is a beautiful town on Bras d'Or Lake. It's the perfect place to end your Cabot Trail journey.